It's December! And you know what that means... clutter! For most of us, more items enter our homes this month than any other time of year. And we're so much more aware of the clutter in our homes because we tend to entertain more this month than other times of the year as well. Besides all that, December can feel so overwhelming... there are so many extra tasks to do, places to go, and people to see. All of these factors make it hard to enjoy this otherwise wonderful time of year! Whenever I feel overwhelmed I've learned that I will usually feel better if I declutter (at any time of year... it's really a stress reliever!). But over the last several years I've found that the single most important thing I can do to help me feel less overwhelmed in December is to declutter throughout the month. For the last three years, I've hosted the #NetZeroClutter challenge and many of you joined in and decluttered in December. 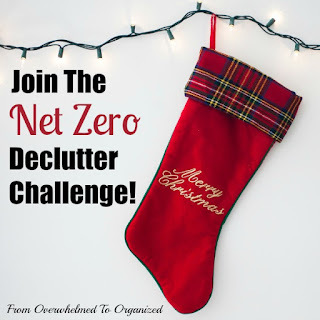 Will you join the Net Zero Decluttering Challenge this year? I'll be sharing decluttering tips and ideas this month to help you declutter a different area of your home. If you do that consistently throughout the month, you can end the month with the same number of items in your home (or ideally even less!) than what you started the month with! By the way, you can check out the previous #NetZeroClutter series here for more tips. The first year it was a daily series, so if you think that would help you more than a weekly post, feel free to follow along with that series as well or instead! It's good to declutter at any time of year, but many people are more aware of their clutter in December. We love all the gifts that were given to our family members but we aren't sure where we'll put them all now that they are unwrapped. With all the special celebrations during the holidays, we just want to enjoy our homes with our friends and family. That makes it extra frustrating when we're dealing with clutter. I couldn't believe the difference it made when I started decluttering our home, especially when I did it in December. Are you ready to join in and feel less overwhelmed this year?! Anything you want! I'll give ideas, but just like in the 365 Items in 365 Days challenge you can declutter whatever you want whenever you want. I know some people like ideas, so each Saturday, I'll share some tips to help you declutter an area of your home or a category of items. You can see the whole list in the picture below. Hopefully these ideas and tips will help you end the month with the same number of items in your home (or hopefully even less!) than what you started the month with. Don't forget, you can declutter anything you want this month! You don't have to follow this plan. Or you can change up the plan to better fit your home, your available time, and most importantly your clutter. Declutter early in the month. Most of the items will enter our homes near the end of December but we'll be too busy celebrating at that point to really declutter, so I recommend doing more decluttering in the early part of the month to compensate for that. Interestingly, many of you who have participated in this challenge with me the last few years have commented that doing this challenge actually makes you much more aware of what is entering your home. I know I was surprised the first year in particular at how often things come in our home that I never thought about. When trying to reduce clutter in our homes (at any time of year! ), it's important to be aware of what is coming in just as much as what is going out. First, go through ALL your holiday items. Declutter anything you're not using this year (or at least ask yourself why you aren't using it and think about whether you will use it again in the future... chances are you won't). Throughout this challenge I'll share my progress decluttering and I'll be tracking what comes in our home. My estimate of items entering our home this month is 150. Which means my goal is to declutter at least 150 items in this challenge. This is a little lower than it was the last 3 years, but we're once again scaling back on gifts we're giving to our kids and each other this year (to reduce clutter but also because as they kids get older their gifts tend to have more value). I still keep the number fairly high because we do receive a lot of gifts from our families and my birthday is in December too. I've been decluttering throughout the year, but every December when I intentionally go through my home I always find more, so I know we can find plenty of clutter to let go of this month. Overall I think it's a realistic goal. As always, for items coming in, I'm not counting gifts we're buying this month that we'll be giving away in a few weeks. I'm also not counting gifts we're giving to people outside our home as items out. You can count them as they come in and as they go out if you'd like, but I'm not going to bother... I'm focused mainly on items that have been here for or are staying for awhile. I will count gifts we're giving our kids and that my hubby and I give to each other (when they are given) since those items will be staying. Also I won't count consumable items that were given to us or that we gave our kids or each other, since they won't actually be staying long term. So as of now I'm at 0 items in and 0 items out, with a goal of decluttering 150 items in December. So that's this week's post in the Net Zero Decluttering Challenge! I'll be back next week with tips and ideas for decluttering kids' items. Great post Hilda! You've given us lot of decluttering tips, at the perfect time of year. 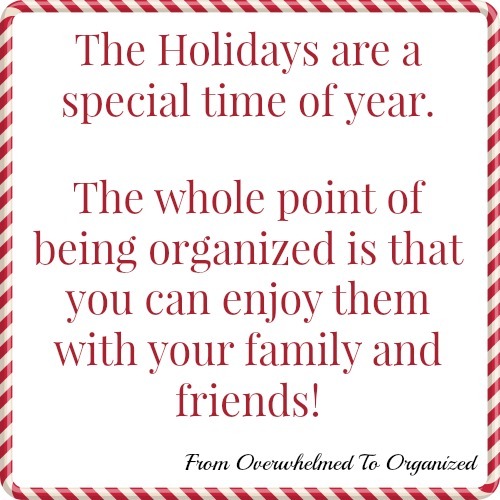 I wrote a similar blog called 'seasonal organizing,'but as you've pointed out, there are plenty of reasons to declutter during the holiday season, especially in December . It's always a good time to declutter isn't it Shannon? I'll check out your tips too. I love your Net Zero clutter challenge. It adds accountability and fun, which is especially valuable for people that are clutter challenged. I've been on a quest to let go of things. I've never used a chart like the one you shared (love that,) and wonder if it might help me to get rid of even more things. Great idea! Thanks Linda! I find actually counting and recording items leaving my home makes me more motivated to declutter. And recording what is entering my home has been eye opening. Hope you are able to declutter more with the printable list! Lots of people are telling us how to buy less, or how to get rid of stuff, but you're the only one I've seen who shows that it's really all about balance - I love it! Thanks Janet! Those posts are all important too, but over the last few years of doing this challenge I've really found this approach helpful. I scheduled a charity pick-up just to make sure I would keep up with the decluttering during the holiday season. It does feel good to move stuff out, especially at a time of year when so much is coming in! We are getting new carpets in our bedroom and hallway. So, we started clearing out our stuff from the bedroom and closet last weekend. It's refreshing to not have the stuff around. I'm not sure if these knick knacks will return at this point. We are also going to paint the room with a fresh new color. It's like a present for my husband and myself before the indoor percussion season starts for my daughter in January. Nothing like renovations to help you declutter! I really like the idea of a reno as a gift from a couple to each other. Good luck with everything!